Illustration: Stanley Bulbach. 'Agate Stream'. It is always interesting to see how different creative individuals approach their work and their medium, but it is often just as interesting to see where these individuals originated, where they gained their core influences, and what sent them along their unique creative path. Many are not always walking along the clear-cut path you would imagine. The artist Stanley Bulbach has a BA in History of Religion and an MA and PhD in Near Eastern Studies. Although these qualifications do not automatically suggest that a career in the creative arts is imminent, it also doesn't necessarily disallow it. There are so many avenues and pathways towards a truly creative life, how you get onto that path can be just as interesting as the path that you follow as an individual. Illustration: Stanley Bulbach. 'Agate Stream' detail. It is often assumed that the creative arts are reserved for academic underachievers, those who couldn't make it in the academic world. However, nothing could be further from the truth. 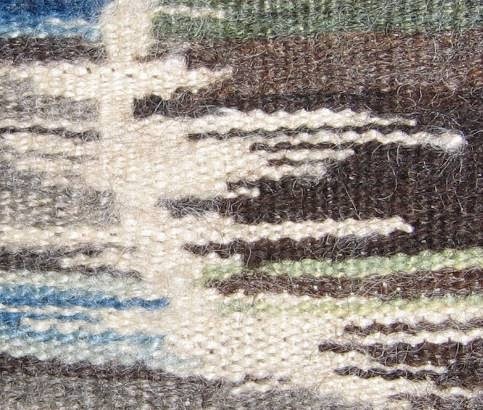 Since starting The Textile Blog, I have come across a range of individuals who have taken up creative arts careers from a diverse background of degrees, diplomas, and lifetime work that have seemingly little in common with the creative art world, but then of course all paths are linked, often on a much subtler level than many can see. Whatever you do in life is part of your ultimate path. If you decide to be a car mechanic, and then thirty years later shift focus into 3D sculpture, then that is your path. If you work in admin for forty years and then decide to take up quilting, then that too is your path. If, like Stanley you take the road from seeming academia, research, and then the development of a fascination with North African carpet weaving through a trip through the Atlas Mountains of Morocco, then that is another path towards the creative arts. Stanley has a deep knowledge, understanding, and sympathy for the history and traditions of carpet weaving across the Islamic world, particularly those traditions that are found in North Africa. He has an exhaustive knowledge of traditional weaving found across North Africa. However, with Stanley it isn't a matter of imbuing his carpets just with a flavour of North Africa. These are not carpets that focus on reproducing the traditions of a cultural heritage half a world away from his New York City base. These are not therefore merely extensions of the magic and passion of North Africa, though they are inevitably imbued with it, they also importantly contain part of the personality and perspective of the artist. Stanley may well call his woven pieces 'carpets' and they are definitely within the general genre of that medium, but they are much more than the name 'carpet' could suggest, and shouldn't necessarily be treated as practical domestic accessories. These are pieces of personal artwork, artwork that could and should equally be expected to have a place reserved for them on a wall, rather than a floor. It would probably be best to describe them as somewhere between a woven tapestry and a woven fine art carpet. The description doesn't really do Stanley's work full justice, but it does give some indication of where his artwork should be. 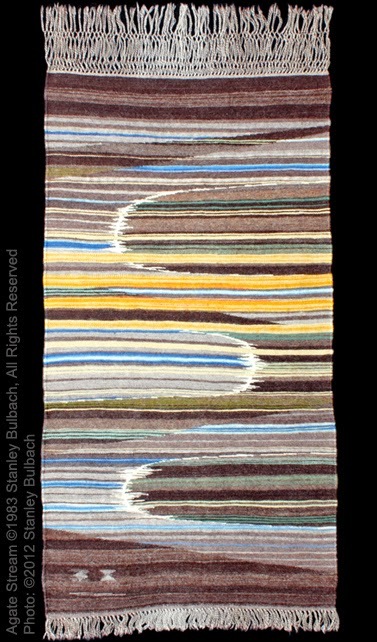 However, perhaps more important than artistic freedom and the focus on individual perspective that automatically comes with the creative arts, Stanley is also aware of the unique symbolism that is encased in the history and continuity of woven carpet-making as well as the usage of the carpet. To many in the world it is still a vital ingredient of domesticity, and through that, is intimately connected to human life. Woven carpets have been used for all of the major celebrations of human life from birth, through marriage, to death. Carpets can be seating, bedding, used for birthing or for shrouds for the dead. They can be given as gifts, or kept as heirlooms within families as remembrances of generations past and those yet to come. Carpets are also significant partners in prayer; many of Stanley's woven pieces derive at least an element of their origin from the widespread use of prayer rugs that are seen across the Islamic world. Weaving itself has always been used as a wide-ranging symbol, particularly when used in the context of the ideals symbolised through the singular weakness of isolated threads compared to the strength achieved by those isolated threads when woven into a fabric. 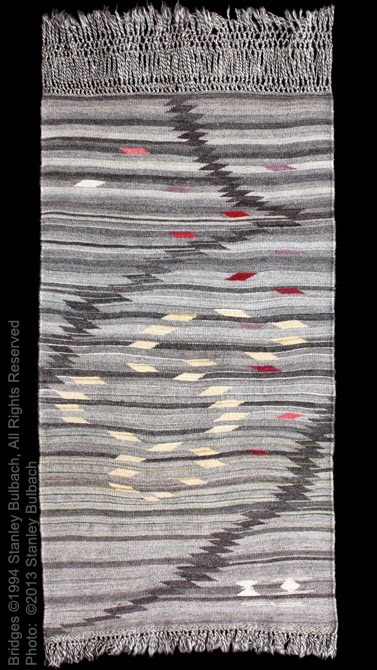 When expanded into weaving as an art form, an artistic statement even, it can be seen that weaving could easily be used as a metaphor for the contemporary world we live in today. Illustration: Stanley Bulbach, the artist. Through our expression of endless and unique diversity as individuals, we can with effort, weave ourselves into the fabric that is humanity. By weaving together the diverse strengths of each of us, we create a fabric that cannot easily be ripped apart. 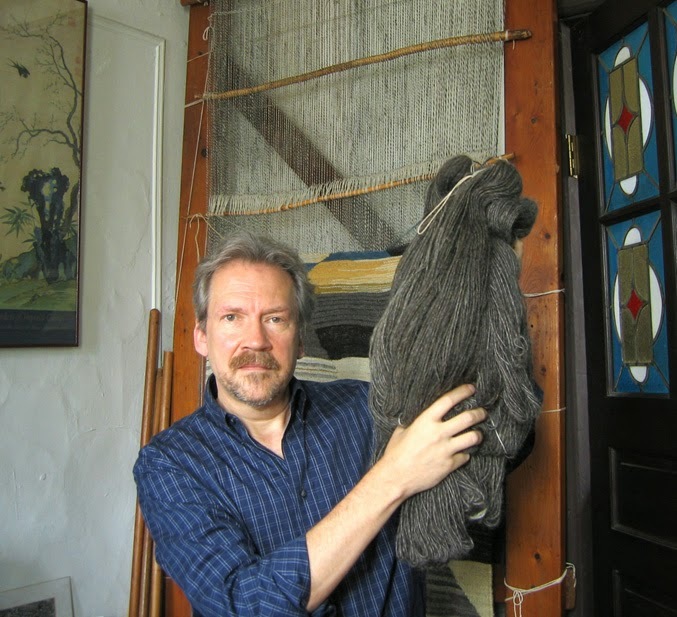 In this respect, Stanley sees his work as a weaver, and with his local community work looking for solutions to the problems of such a large and diverse population as New York City, the two very much become the same thing. Whether you are weaving with yarn or you are weaving with people, a harmonious and interestingly diverse outcome is always hoped for. Stanley himself weaves a complex subject of research, practical knowledge, and theory that is far too complex to touch on much in this short article, more can be seen and read at Stanley's website, a link to which is given below. However, I hope this has been a good introduction to the work of Stanley Bulbach, and if you are in the New York City area, Stanley's work can presently be seen at the Jason McCoy Gallery. Please be aware that all photos of artwork illustrating this article were kindly supplied by the artist and are therefore copyrighted to him. my aunt would like these. 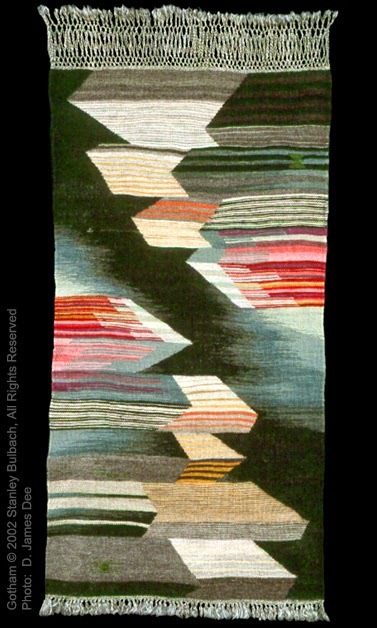 she did weavings similar. she's beading now. I love his designs! They are so calming and so beautiful! Wow, such strong work! Thanks for introducing us to yet another wonderful artist. Stanley's work is beautiful and of the highest quality. I should know because one of his carpets is proudly hanging on my dining room wall. So happy to see this new recognition for him. You are so lucky Susan. A great talent and an endlessly interesting individual. Wonderful introduction to his work. Thanks!